Ephemeral content, which lasts only a short time before disappearing, is on the rise and being led by the popularity of Snapchat. Other platforms like Instagram and Facebook are following in Snapchat’s footsteps, so now more and more platforms are providing a similar service for distributing short-lived content. 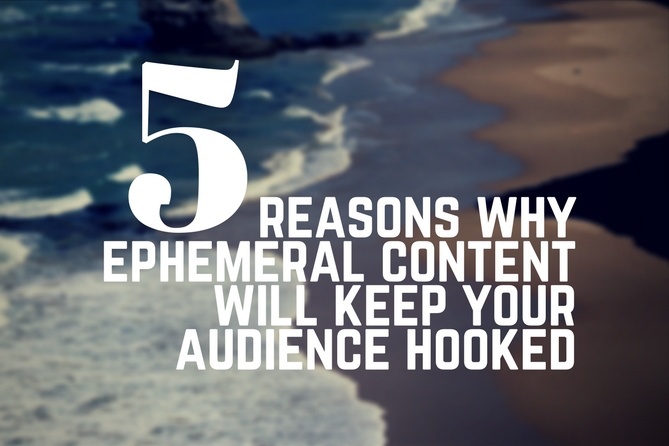 Ephemeral content is fleeting, and novel, which is the appeal for many (especially younger) users. Live streaming videos, and Snapchat Stories, are a few examples of ephemeral content. Is it worth investing your limited time and money to develop content that disappears in moments or within 24 hours? Imagine your nonprofit is all over social media, you’re posting regularly, but not getting the kind of engagement you would like from your followers. As video marketing is gaining popularity, there’s an inexpensive and potentially effective way to market your organization and keep followers coming back for more. Let's look at five reasons short-lived content can appeal to your audience. There’s no surprise that people are constantly bombarded with polished advertising and companies trying to sell products and services. Changemakers can alter the world of marketing through putting out raw clips and images that represent the brand in a light that differs from traditional marketing tactics. Users who make the conscious decision to follow a brand on Snapchat or Instagram gain a sense of trust and excitement for the brand, which goes along with lead nurturing. This authentic look into a brand encourages followers to stay for the long haul and be more involved than the passive consumer. The novel aspect of ephemeral content strikes a FOMO effect or “fear of missing out” so users are more inclined to tune in at a certain time and maybe even on a regular basis. For marketers, constantly creating engaging content is a must when developing campaigns around this ephemeral content world. This poses a challenge for marketers to be on top of their game when curating content for these channels because they cannot be made and recycled like other campaigns. Brands can hold Q&A’s, how-to’s, and so much more behind the scenes content that is harder to come by from other social media channels. The possibilities are endless for marketers to engage with their audiences in a way that gives more than just a promotion or print ad. Organizations are able to showcase behind the scenes content, preview upcoming projects or products, show events, and offer promotions. For the movie Mission Impossible: Rogue Nation, they used Snapchat to hold missions for their followers. Fans responded to the call-to-action by submitting pictures or sending in videos that helped promote the film, as well as gave fans the opportunity to interact with the franchise. With 65 million impressions, it showed a great integration of technology and marketing. Users are able to directly interact with the campaign and invest. Nearly 77% of all adults have a smartphone according to Pew Research Center and that number only increases as the age bracket becomes closer to college age. No need for fancy camera equipment or video editing software to take advantage of this marketing method. Organizations can distribute a QR or Snapcode to access stories and by just scanning the code with the camera on a user’s phone, find the organization’s Snapchat profile. Visual content is 40X more likely to get shared on social media than other types of content. Not only are users are more likely to share visual content, they are also more engaged. Snapchat provides a service in which users to create geo-filters which brands can take advantage for a time and location sensitive event. This inexpensive service gives everyone who is within the location in a given time to put a filter over their snaps and in a way, crowd-source promote the event. 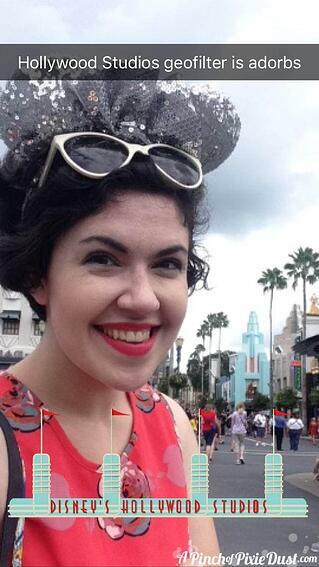 Here’s and example below of Disneyworld’s geo-filter for Hollywood Studios which anyone with a smartphone can use when they’re at that location. Ephemeral content is here to stay, so if your audience includes an active and fast-paced segment why not include it in your organization's marketing mix? Where the restrictions of ephemeral content can seem limiting, such as having a single window of time to tune in or content not as easily recyclable or searchable as other forms of marketing, it is inexpensive, authentic, and can result in great engagement from your most dedicated followers. Jennifer Yee is a senior at Champlain College anticipating a marketing degree and psychology minor. Originally from Massachusetts, she hopes to work alongside an organization that holds corporate social responsibility to a higher regard.